Note: This page is part of the section about the structure and function of different Tissue Types, which is related to the section about Histology and Cells (incl. structure of animal cells, cell division, mitosis, meiosis). The tissue types section is included to complete description of ' Histology - The Cell ' required by some courses in First-Level Anatomy and Physiology. 1.0 Where in the body are the blood tissues ? The components of blood are referred to as blood 'tissue' on this page / section. Blood tissues are found inside the blood vessels (arteries, arterioles, capillaries, venules and veins; see systemic circulation for further details about the path the blood follows and the names of specific blood vessels) and also within the chambers of the heart. Some white blood cells are also found in other types of body tissues, for example lymphocytes are also found in the lymphatic system. Blood consists of many components (constituents). Of these, 99% are erythrocytes (red blood cells) and 1% are leucocytes (white blood cells) and thrombocytes (blood platelets). 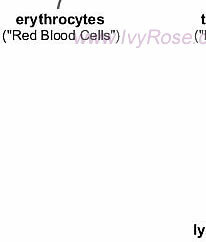 The summary chart above includes: erythrocytes (red blood cells), thrombocytes (blood platelets) and leucocytes (white blood cells). It also includes categories of leucocytes: agranulocytes and granulocytes (also known as polymorphonucleocytes), which may also be sub-divided into lymphocytes, monocytes, basophils, neutrophils and eosinophils. 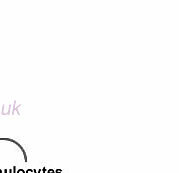 Blood plasma is a pale coloured liquid that contains the blood cells mentioned in the three sub-sections below. It is approx. 90% water, the rest of its mass being due to dissolved substances. These dissolved substances include food for the body's cells, waste matter and carbon dioxide (CO2) for removal from the body, antibodies to fight infections, and hormones and enzymes that control the body's processes. Read more about blood plasma. Red blood cells (more formally called "erythrocytes") have the physical form of disc-shaped cells that have no nuclei when mature. They contain an iron compound called haemoglobin which gives blood its dard red colour. White blood cells (more formally called "leucocytes") are large opaque blood cells - which means that they appear to be solid rather than transparent, therefore one cannot see through them. There are many different types of white blood cells, each of which has a different physical structure and functions within the immune system. Blood Platelets (more formally called "thrombocytes") are very small disc-shaped bodies that do not have any nuclei. They have an important role in blood clotting and so they gather at locations of injury. The pH of blood must remain in the range 6.8 to 7.4, otherwise it begins to damage cells. The kidneys filter all of the blood in the body (approx. 8 pints), 36 times every 24 hours. Toxins removed from the blood by the kidneys leave the body in the urine. (such as in the cases of people on western diets containing more salt than the body requires). See also related pages about: the structure and functions of blood (similar information to that on this page - but in more detail; most of the information on this page is extracted from the main "The Structure and Functions of Blood" page), the Glossary Pages about the components of blood, the structure and functions of blood vessels (related information), and blood pressure (related information).